Probashbangla24 online Desk : The government has announced plans for a Festival of Great Britain and Northern Ireland to take place in 2022. The proposal was unveiled as the Conservatives gathered in Birmingham for their annual party conference. Prime Minister Theresa May said the festival will strengthen what she describes as “our precious union”. On Sunday, she defended her approach to Brexit, after former foreign secretary Boris Johnson labelled her plan for leaving the EU as “deranged”. 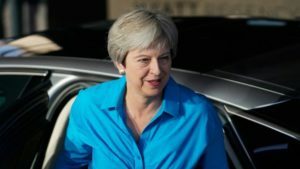 Mrs May has said those who refuse to back the Chequers plan for Brexit are “playing politics”. The Festival of Great Britain and Northern Ireland is described as a “nationwide festival in celebration of the creativity and innovation of the United Kingdom”. Downing Street said it will mark the anniversary of a number of events. However, the centenary of the creation of Northern Ireland in 2021 was not specified on their list. Downing Street described the nationwide festival as a “unique event” that echoes the 1851 Great Exhibition and will take place 70 years after the 1951 Festival of Britain. “Just as millions of Britons celebrated their nation’s great achievements in 1951, we want to showcase what makes our country great today,” said Mrs May.